PSI4 provides a wide variety of quantum chemical methods using state-of-the-art numerical methods and algorithms. Several parts of the code feature shared-memory parallelization to run efficiently on multi-core machines (see Sec. Threading). An advanced parser written in Python allows the user input to have a very simple style for routine computations, but it can also automate very complex tasks with ease. PSI4 is, in many ways, a whole new package compared to Psi3. While some libraries and modules remain the same, the majority of the code has been rewritten from scratch based on a powerful set of new libraries written in C++. A totally new Python front-end makes PSI4 incredibly user-friendly and automates many common tasks such as basis set extrapolation, composite methods, running the same computation on every molecule in a test set, etc. Density-functional theory, absent in Psi3, is quite efficient in PSI4, with many functionals available. Density fitting is ubiquitous in PSI4, leading to some of the most efficient MP2 and CCSD(T) code available. PSI4 also introduces extensive, powerful features for energy component analysis of non-covalent interactions via symmetry-adapted perturbation theory. Orbital-optimized versions of perturbation theory and coupled-cluster methods, and their analytic gradients, have also been added. Through external libraries, PSI4 gains access to implicit solvent (PCM) capabilities, density-matrix renormalization group CI, effective fragment potentials, Grimme dispersion corrections, and high-order coupled-cluster theory. In this section, we provide an overview of some of the features of PSI4 along with the prerequisite steps for running calculations. Sec. Tutorial provides a brief tutorial to help new users get started. Section Psithon offers further details into the structure of PSI4 input files and how Python can be mixed with quantum chemistry directives in PSI4. Section Psithon Functions provides more detail on the Python functions provided by PSI4 and discusses some of the higher-level functions such as counterpoise correction, complete-basis-set extrapolation, and running computations on an entire database of molecules at a time. Later sections deal with the different types of computations which can be done using PSI4 (e.g., Hartree–Fock, MP2, coupled-cluster) and general procedures such as geometry optimization and vibrational frequency analysis. The Appendices include a complete description of all possible input keywords for each module, as well as tables of available basis sets and a listing of the sample input files available under psi4/samples. The user is urged to examine this directory of sample inputs, as most common types of computations are represented there. For the latest PSI4 documentation, check www.psicode.org. “Psi4 1.1: An Open-Source Electronic Structure Program Emphasizing Automation, Advanced Libraries, and Interoperability”, R. M. Parrish, L. A. Burns, D. G. A. Smith, A. C. Simmonett, A. E. DePrince III, E. G. Hohenstein, U. Bozkaya, A. Yu. Sokolov, R. Di Remigio, R. M. Richard, J. F. Gonthier, A. M. James, H. R. McAlexander, A. Kumar, M. Saitow, X. Wang, B. P. Pritchard, P. Verma, H. F. Schaefer III, K. Patkowski, R. A. King, E. F. Valeev, F. A. Evangelista, J. M. Turney, T. D. Crawford, and C. D. Sherrill, J. Chem. Theory Comput., 13(7) 3185–3197 (2017). (doi: 10.1021/acs.jctc.7b00174). “Psi4: An open-source ab initio electronic structure program,” J. M. Turney, A. C. Simmonett, R. M. Parrish, E. G. Hohenstein, F. Evangelista, J. T. Fermann, B. J. Mintz, L. A. Burns, J. J. Wilke, M. L. Abrams, N. J. Russ, M. L. Leininger, C. L. Janssen, E. T. Seidl, W. D. Allen, H. F. Schaefer, R. A. King, E. F. Valeev, C. D. Sherrill, and T. D. Crawford, WIREs Comput. Mol. Sci. 2, 556 (2012). (doi: 10.1002/wcms.93). Depending on the particular modules used, the user may also wish to cite some of the following references for theoretical, algorithmic, or implementation contributions specific to PSI4 (in addition to appropriate references for the underlying theory, which are not necessarily included in the list below). “Principles for a direct SCF approach to LCAO-MO ab-initio calculations”, J. Almlöf, K. Faegri, and K. Korsell, J. Comput. Chem. 3, 385 (1982). (doi: 10.1002/jcc.540030314). “Starting SCF calculations by superposition of atomic densities”, J. H. Van Lenthe, R. Zwaans, H. J. J. Van Dam, and M. F. Guest, J. Comput. Chem. 27, 926 (2006). (doi: 10.1002/jcc.20393). “An assessment of initial guesses for self-consistent field calculations. Superposition of Atomic Potentials: simple yet efficient”, S. Lehtola, J. Chem. Theory Comput. (2019) (doi: 10.1021/acs.jctc.8b01089). “Density Cumulant Functional Theory: First Implementation and Benchmark Results for the DCFT-06 Model,” A. C. Simmonett, J. J. Wilke, H. F. Schaefer, and W. Kutzelnigg, J. Chem. Phys. 133, 174122 (2010). (doi: 10.1063/1.3503657). “Analytic gradients for density cumulant functional theory: The DCFT-06 model,” A. Yu. Sokolov, J. J. Wilke, A. C. Simmonett, and H. F. Schaefer, J. Chem. Phys. 137, 054105 (2012). (doi: 10.1063/1.4739423). “Density cumulant functional theory: The DC-12 method, an improved description of the one-particle density matrix,” A. Yu. Sokolov, A. C. Simmonett, and H. F. Schaefer, J. Chem. Phys. 138, 024107 (2013). (doi: 10.1063/1.4773580). “Orbital-optimized density cumulant functional theory,” A. Yu. Sokolov, and H. F. Schaefer, J. Chem. Phys. 139, 204110 (2013). (doi: 10.1063/1.4833138). “Density cumulant functional theory from a unitary transformation: N-representability, three-particle correlation effects, and application to O4+,” A. Yu. Sokolov, H. F. Schaefer, and W. Kutzelnigg, J. Chem. Phys. 141, 074111 (2014). (doi: 10.1063/1.4892946). “The Configuration Interaction Method: Advances in Highly Correlated Approaches,” C. D. Sherrill and H. F. Schaefer, in Adv. Quantum Chem., vol. 34, P.-O. Löwdin, Ed. (Academic Press, New York, 1999), pp. 143-269. (doi: 10.1016/S0065-3276(08)60532-8). “An Introduction to Coupled Cluster Theory for Computational Chemists,” T. D. Crawford and H. F. Schaefer, Rev. Comp. Chem. 14, 33-136 (2000). (doi: 10.1002/9780470125915.ch2). “Accurate Noncovalent Interaction Energies Using Truncated Basis Sets Based on Frozen Natural Orbitals,” A. E. DePrince and C. D. Sherrill, J. Chem. Theory Comput. 9, 293-299 (2013). (doi: 10.1021/ct300780u). “Accuracy and Efficiency of Coupled-Cluster Theory Using Density Fitting / Cholesky Decomposition, Frozen Natural Orbitals, and a T1-Transformed Hamiltonian,” A. E. DePrince and C. D. Sherrill, J. Chem. Theory Comput. 9, 2687-2696 (2013). (doi: 10.1021/ct400250u). “A noniterative asymmetric triple excitation correction for the density-fitted coupled-cluster singles and doubles method: Preliminary applications,” U. Bozkaya, J. Chem. Phys. 144, 144108 (2016). (doi: 10.1063/1.4945706). “Analytic energy gradients for the coupled-cluster singles and doubles method with the density-fitting approximation,” U. Bozkaya and C. D. Sherrill, J. Chem. Phys. 144, 174103 (2016). (doi: 10.1063/1.4948318). “Analytic energy gradients for the coupled-cluster singles and doubles with perturbative triples method with the density-fitting approximation,” U. Bozkaya and C. D. Sherrill, J. Chem. Phys. 147, 044104 (2017). (doi: 10.1063/1.4994918). PSI4 features production-level Mukherjee-style state-specific coupled-cluster theory, including perturbative triples and also associated multi-reference perturbation theories. The theory and PSI4 implementation of these methods is discussed in the following papers. “Coupling Term Derivation and General Implementation of State-Specific Multireference Coupled-Cluster Theories,” F. A. Evangelista, W. D. Allen, and H. F. Schaefer, J. Chem. Phys. 127, 024102 (2007). (doi: 10.1063/1.2743014). “Perturbative Triples Corrections in State-Specific Multireference Coupled Cluster Theory,” F. A. Evangelista, E. Prochnow, J. Gauss, and H. F. Schaefer, J. Chem. Phys. 132, 074107 (2010). (doi: 10.1063/1.3305335). “Triple Excitations in State-Specific Multireference Coupled Cluster Theory: Application of Mk-MRCCSDT and Mk-MRCCSDT-n Methods to Model Systems,” F. A. Evangelista, A. C. Simmonett, W. D. Allen, H. F. Schaefer, and J. Gauss, J. Chem. Phys. 128, 124104 (2008). (doi: 10.1063/1.2834927). “A Companion Perturbation Theory for State-specific Multireference Coupled Cluster Methods,” F. A. Evangelista, A. C. Simmonett, H. F. Schaefer, D. Mukherjee, and W. D. Allen, Phys. Chem. Chem. Phys. 11, 4728-4741 (2009). (doi: 10.1039/b822910d). “Perturbation Theory Approach to Intermolecular Potential Energy Surfaces of van der Waals Complexes,” B. Jeziorski, R. Moszynski, and K. Szalewicz, Chem. Rev. 94, 1887-1930 (1994). (doi: 10.1021/cr00031a008). “Levels of Symmetry Adapted Perturbation Theory (SAPT). I. Efficiency and Performance for Interaction Energies,’’ T. M. Parker, L. A. Burns, R. M. Parrish, A. G. Ryno, and C. D. Sherrill, J. Chem. Phys. 140, 094106 (2014). (doi: 10.1063/1.4867135). The theory and implementation of DF-SAPT is discussed in the following papers for various levels of SAPT. “Large-scale Symmetry-adapted Perturbation Theory Computations via Density Fitting and Laplace Transformation Techniques: Investigating the Fundamental Forces of DNA-Intercalator Interactions,” E. G. Hohenstein, R. M. Parrish, C. D. Sherrill, J. M. Turney, and H. F. Schaefer, J. Chem. Phys. 135, 174017 (2011). (doi: 10.1063/1.3656681). “Density Fitting and Cholesky Decomposition Approximations in Symmetry-Adapted Perturbation Theory: Implementation and Application to Probe the Nature of \(\pi - \pi\) Interactions in Linear Acenes,” E. G. Hohenstein and C. D. Sherrill, J. Chem. Phys. 132, 184111 (2010). (doi: 10.1063/1.3426316). “Density Fitting of Intramonomer Correlation Effects in Symmetry-Adapted Perturbation Theory,” E. G. Hohenstein and C. D. Sherrill, J. Chem. Phys. 133, 014101 (2010). (doi: 10.1063/1.3451077). “Wavefunction Methods for Noncovalent Interactions,” E. G. Hohenstein and C. D. Sherrill, WIREs: Comput. Mol. Sci. 2, 304-326 (2012). (doi: 10.1002/wcms.84). “Efficient Evaluation of Triple Excitations in Symmetry-Adapted Perturbation Theory via MP2 Natural Orbitals,” E. G. Hohenstein and C. D. Sherrill, J. Chem. Phys. 133, 104107 (2010). (doi: 10.1063/1.3479400). “Tractability Gains in Symmetry-Adapted Perturbation Theory Including Coupled Double Excitations: CCD+ST(CCD) Dispersion with Natural Orbital Truncations,’’ R. M. Parrish, E. G. Hohenstein, and C. D. Sherrill, J. Chem. Phys. 139, 174102 (2013). (doi: 10.1063/1.4826520). “Chemical Assignment of Symmetry-Adapted Perturbation Theory Interaction Energy Components: The Functional-Group SAPT Partition,” R. M. Parrish, T. M. Parker, and C. D. Sherrill, J. Chem. Theory Comput. 10, 4417 (2014). (doi: 10.1021/ct500724p). “Quadratically convergent algorithm for orbital optimization in the orbital-optimized coupled-cluster doubles method and in orbital-optimized second-order Møller–Plesset perturbation theory,” U. Bozkaya, J. M. Turney, Y. Yamaguchi, H. F. Schaefer, and C. D. Sherrill, J. Chem. Phys. 135, 104103 (2011). (doi: 10.1063/1.3631129). “Analytic energy gradients for the orbital-optimized second-order Møller–Plesset perturbation theory,” U. Bozkaya and C. D. Sherrill, J. Chem. Phys. 138, 184103 (2013). (doi: 10.1063/1.4803662). “Orbital-Optimized Second-Order Perturbation Theory with Density-Fitting and Cholesky Decomposition Approximations: An Efficient Implementation,” U. Bozkaya, J. Chem. Theory Comput. 10, 2371 (2014). (doi: 10.1021/ct500231c). “Orbital-Optimized Third-Order Møller–Plesset Perturbation Theory and Its Spin-Component and Spin-Opposite Scaled Variants: Application to Symmetry Breaking Problems,” U. Bozkaya, J. Chem. Phys. 135, 224103 (2011). (doi: 10.1063/1.3665134). “Assessment of Orbital-Optimized Third-Order Møller–Plesset Perturbation Theory and Its Spin-Component and Spin-Opposite Scaled Variants for Thermochemistry and Kinetics,” E. Soydas and U. Bozkaya, J. Chem. Theory Comput. 9, 1452 (2013). (doi: 10.1021/ct301078q). “Analytic energy gradients for the orbital-optimized third-order Møller–Plesset Perturbation Theory,” U. Bozkaya, J. Chem. Phys. 139, 104116 (2013). (doi: 10.1063/1.4820877). “Orbital-optimized coupled-electron pair theory and its analytic gradients: Accurate equilibrium geometries, harmonic vibrational frequencies, and hydrogen transfer reactions,” U. Bozkaya and C. D. Sherrill, J. Chem. Phys. 139, 054104 (2013). (doi: 10.1063/1.4816628). “Orbital-optimized MP2.5 and its analytic gradients: Approaching CCSD(T) quality for noncovalent interactions,” U. Bozkaya and C. D. Sherrill, J. Chem. Phys. 141, 204105 (2014). (doi: 10.1063/1.4902226). “The extended Koopmans’ theorem for orbital-optimized methods: Accurate computation of ionization potentials,” U. Bozkaya, J. Chem. Phys. 139, 154105 (2013). (doi: 10.1063/1.4825041). “Accurate Electron Affinities from the Extended Koopmans’ Theorem Based on Orbital-Optimized Methods,” U. Bozkaya, J. Chem. Theory Comput. 10, 2041 (2014). (doi: 10.1021/ct500186j). “Analytic Energy Gradients and Spin Multiplicities for Orbital-Optimized Second-Order Perturbation Theory with Density-Fitting Approximation: An Efficient Implementation,” U. Bozkaya, J. Chem. Theory Comput. 10, 4389 (2014). (doi: 10.1021/ct500634s). “Orbital-Optimized MP3 and MP2.5 with Density-Fitting and Cholesky Decomposition Approximations,” U. Bozkaya, J. Chem. Theory Comput. 12, 1179 (2016). (doi: 10.1021/acs.jctc.5b01128). “Orbital-optimized linearized coupled-cluster doubles with density-fitting and Cholesky decomposition approximations: an efficient implementation,” U. Bozkaya, Phys. Chem. Chem. Phys. 18, 11362 (2016). (doi: 10.1039/c6cp00164e). “Intermediate state representation approach to physical properties of electronically excited molecules,” J. Schirmer, and A. B. Trofimov, J. Chem. Phys. 120, 11449-11464 (2004). (doi: 10.1063/1.1752875). “Excited State Calculation for Free-Base and Metalloporphyrins with the Partially Renormalized Polarization Propagator Approach,” M. Saitow and Y. Mochizuki, Chem. Phys. Lett. 525, 144-149 (2012). (doi: 10.1016/j.cplett.2011.12.063). “CheMPS2: a free open-source spin-adapted implementation of the density matrix renormalization group for ab initio quantum chemistry,” S. Wouters, W. Poelmans, P. W. Ayers and D. Van Neck, Comput. Phys. Commun. 185 (6), 1501-1514 (2014). (doi: 10.1016/j.cpc.2014.01.019). “The density matrix renormalization group for ab initio quantum chemistry,” S. Wouters and D. Van Neck, Eur. Phys. J. D 68 (9), 272 (2014). (doi: 10.1140/epjd/e2014-50500-1). “Analytic energy gradients for the spin-free exact two-component theory using an exact block diagonalization for the one-electron Dirac Hamiltonian,” L. Cheng and J. Gauss, J. Chem. Phys. 135, 084114 (2011). (doi: 10.1063/1.3624397). “Predicting Near Edge X-ray Absorption Spectra with the Spin-Free Exact-Two-Component Hamiltonian and Orthogonality Constrained Density Functional Theory,” P. Verma, W. D. Derricotte and F. A. Evangelista, J. Chem. Theory Comput. (2015). (doi: 10.1021/acs.jctc.5b00817). The majority of PSI4 was developed on Mac and Linux machines; in principle, it should work on any Unix system. The latest version of the PSI4 program package may be obtained at psicode.org. The package is available as a binary (Installing from Binary) for Linux, macOS, or Windows (via Windows Subsystem for Linux aka Bash on Ubuntu on Windows) or as source code (git repository or zipped archive from https://github.com/psi4/psi4). PSI4 has been successfully compiled using Intel, GCC, and Clang compilers. Compiler requirements are primarily C++14 compliance (i.e., GCC version 5.1 or above). For some architectures, a precompiled binary is available. See Compiling and Installing for details. PSI4 1.1 and 1.2 are supported on Python 2.7, 3.5, and 3.6. After 1.2, only Python 3 will be supported in accordance with other scientific software projects). Now that Python 3.7 is released, the plan is to support >=3.6 or at least two Python versions. PSI4 1.3 supports Python 3.6 and 3.7. 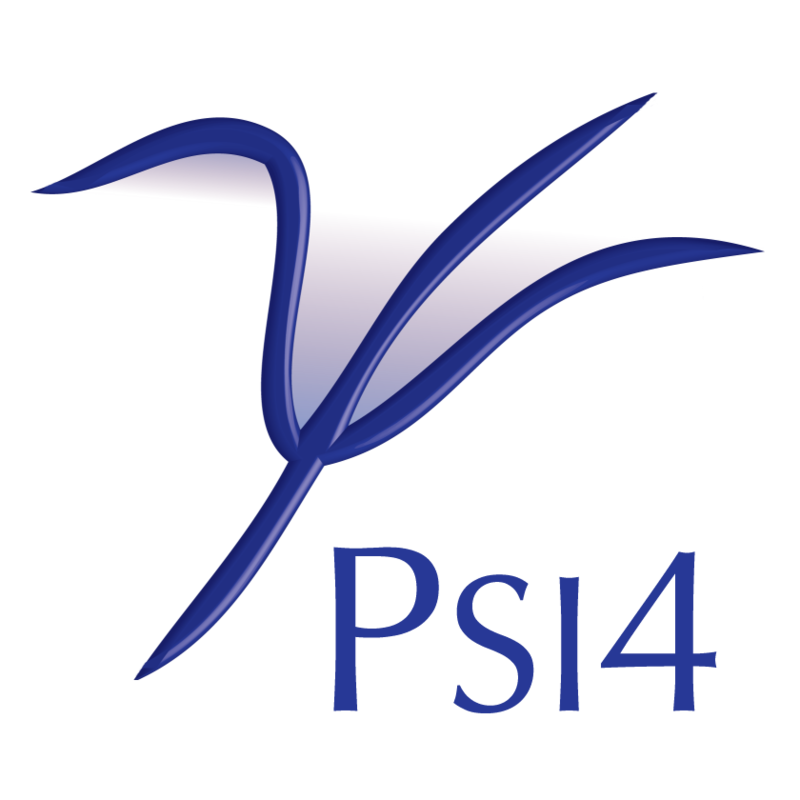 PSI4 is distributed under the GNU Lesser General Public License version 3, LGPL-3.0. Its required dependencies and add-ons have their own licenses, ranging from BSD-2-Clause to GPL-2.0+. It is possible to build PSI4 without any GPL dependencies. PSI4 can perform ab initio computations employing basis sets of contracted Gaussian-type functions of virtually arbitrary orbital quantum number. Many parts of PSI4 can recognize and exploit the largest Abelian subgroup of the molecular point group. Table Methods displays the range of theoretical methods available in PSI4. For more details, see Tables Energy, Energy (DFT), Energy (MRCC), Energy (CFOUR), Gradient, Gradient (CFOUR), and Frequency. Geometry optimization can be performed using either analytic gradients or energy points. Likewise, vibrational frequencies can be computed by analytic second derivatives, by finite differences of analytic gradients, or by finite differences of energies. PSI4 can also compute an extensive list of one-electron properties. The PSI4 package is distributed for free and without any guarantee of reliability, accuracy, or suitability for any particular purpose. No obligation to provide technical support is expressed or implied. As time allows, the developers will attempt to answer inquiries on the forum or GitHub. For bug reports, specific and detailed information, with example inputs, would be appreciated. Frozen natural orbital variant available. In particular, RHF available as CONV. (1, 2) Frozen natural orbital variant available. In particular, RHF available as CONV/DF. DFT gradients only implemented for SCF type DF. LRC-DFT gradients not implemented yet. DH-DFT gradients not implemented. Both EFP/EFP and QM/EFP energies are available. DH-DFT only available with DF-MP2. (1, 2, 3, 4) Not all combinations of reference and algorithm available. In particular, non-RHF references only available as CONV. For CCSD(T), gradients are not available with frozen core. Orbital-optimized variant available. In particular, all references available as CONV/DF. (1, 2, 3, 4, 5, 6, 7, 8, 9, 10) Capabilities breakdown in great detail can be found here.